Glendale, OR – Continuing with the focus on their AR10 / SR25 line of products, V Seven Weapon Systems has introduced the new Harbinger 11.5” .308 SBR and Harbinger 11.5” .308 Complete Uppers. Option #2 takes the same 11.5” .308 lightweight contour fluted barrel but is placed under the 13.5” Magnesium Hyper-light handguard, again in your choice of MLOK or KeyMod, with a HELIOS Titanium Linear Compensator tucked under the end of the handguard giving you a few extra inches of handguard to add grips, lights, etc. For more information please go to www.VSevenWeaponSystems.com or give us a call at 541-832-2179. V Seven Weapon Systems is now offering a new NP3 finish option on their S7 Bolt Catch for .308/DPMS/SR-25 pattern rifles. The black finish will remain available. This bolt catch is machined from S7 tool steel and features enhanced texture on the paddle. 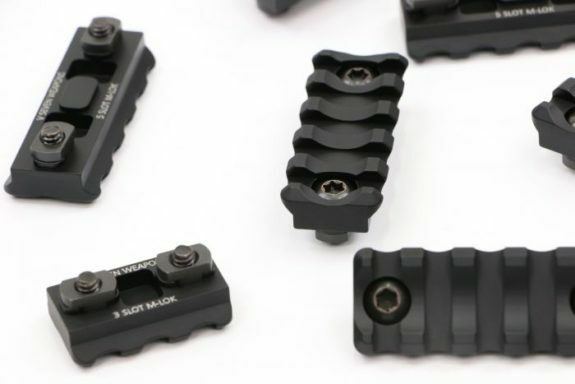 V Seven Weapon Systems is now offering Ultra-Light M-LOK Rail Sections. These rail sections are available in 3 or 5 slot lengths and are machined from 7075-T6 aluminum. 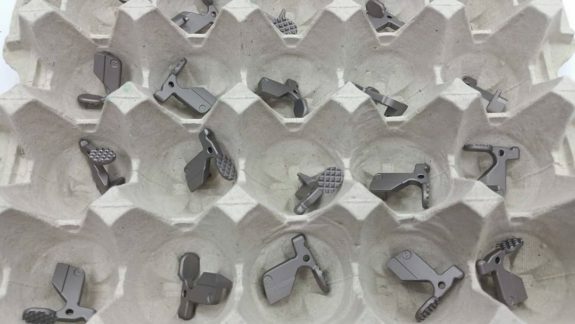 The cross bar sections have been scalloped in the center and pockets of material have been machined out of the back to the rail to remove as much weight as possible. The 3 slot rail section weighs 15.5 grams and the 5 slot weighs 21.5 grams. Those weights include the screws and M-LOK nut. V Seven just rolled out a line of Titanium A2 style muzzle devices. They are machined from grade 5 titanium and available with either a matte, raw finish or a black DLC finish. They are offering both regular and extended lengths for both 5.56 and 7.62 chambered firearms. The regular length, 5.56 version weighs just 1.08 ounces (30.5 grams)! Check out the new line of Ti A2 Style Muzzle Devices at VSevenWeaponSystems.com. The 10/22 20 CAL Barrels from V Seven Weapon Systems (V7) are pretty interesting to say the least. They offer excellent accuracy and make use of a tapered bore (or maybe some voodoo magic) to generate increased velocity and more energy down range. 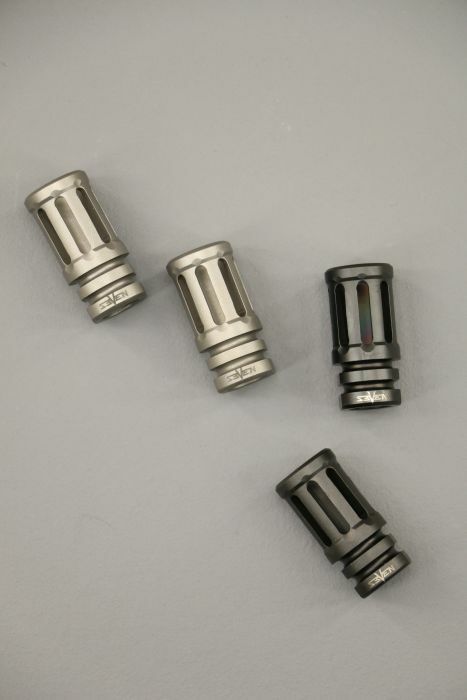 These 416R stainless steel barrels are a direct drop-in replacement for your Ruger 10/22 rifle. 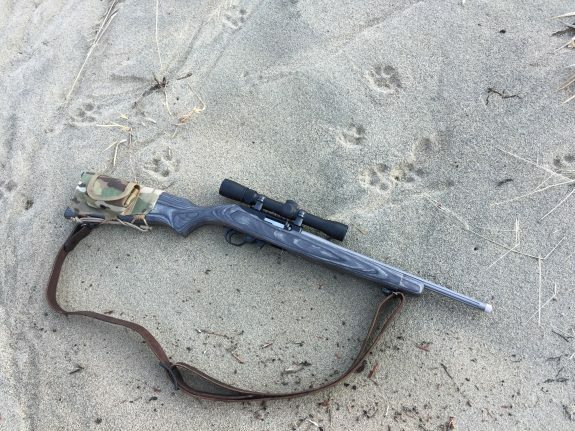 They are available in a 16.1″ sporter profile (the subject of this review) and an 18″ bull barrel profile. 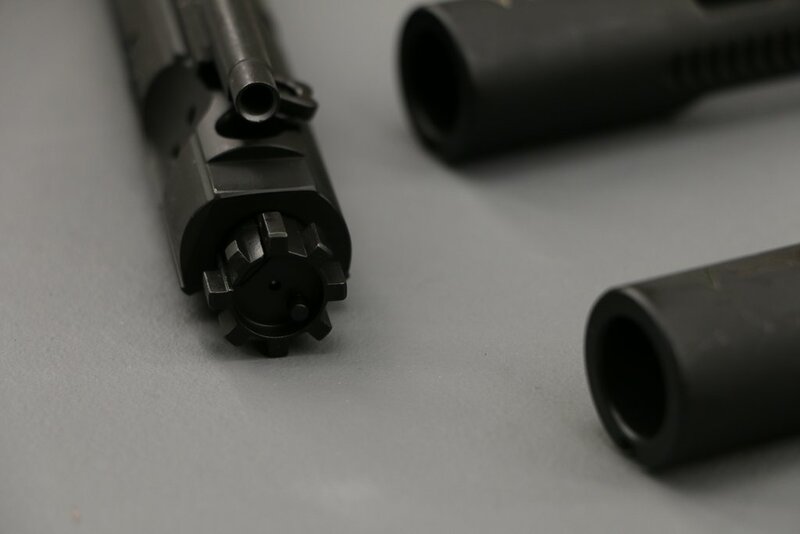 Both barrels have a fluting option, feature a match chamber, threaded muzzle, and have oversized extractor pockets to ensure the extractor can move freely. Both barrels also feature a relatively fast 1 in 10″ twist and a tapered bore that swages the projectile down from .22 caliber to .20 caliber. V7 claims that this feature leads to improved accuracy and reliability, increased ballistic coefficient (from reducing diameter and lengthening the projectile), and more energy down range. I actually saw a small but notable increase in velocity as well (more on that later). The barrel that I tested is the 16.1″, sporter profile version with fluting. I selected this barrel because, based on V7’s claims, I was hoping to use the barrel on my franken-22 to increase its effectiveness as a small game hunting and field rifle. 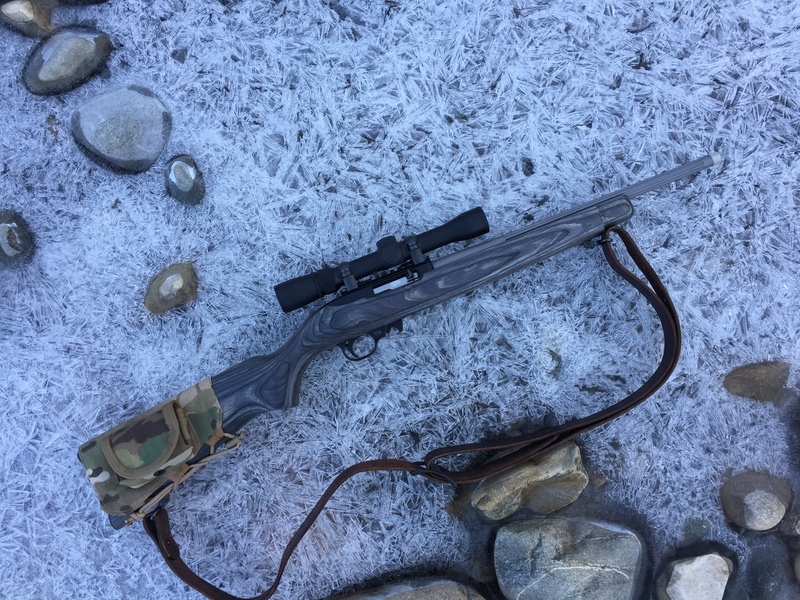 My hope was that I could increase accuracy, increase range, and reduce the overall weight of my rifle just by replacing the barrel… and it worked. There are some bold claims associated with these barrels and I wanted to test them to the extent that I could. I first installed the barrel on a rifle that has become an absolute mish-mash of parts over the years. It has a Weaver 2.5-7×28 Rimfire scope mounted to a mostly original 10/22 receiver and action. The rifle is full of various other replacement parts like an upgraded extractor, a Ruger OEM laminate stock that I picked up cheap years ago, and upgraded trigger parts. The rifle ran great before the barrel install and ran great after so there was no change in reliability. The next step was to try to recover some projectiles. 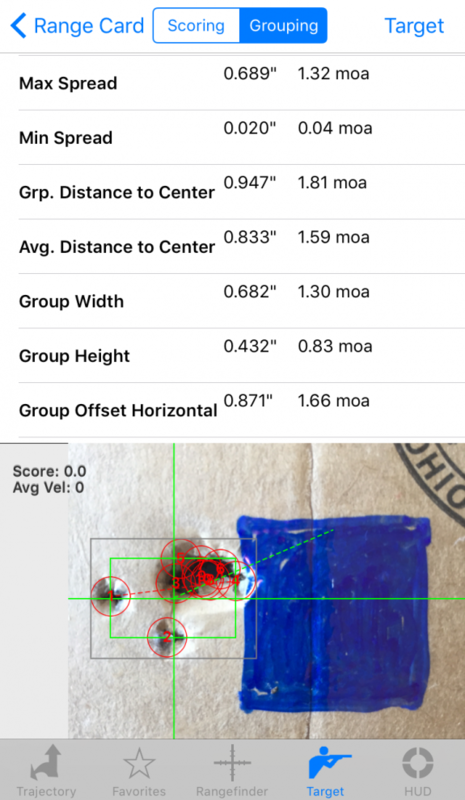 This was done fairly easily and it did confirm that the projectiles are swaged slightly smaller and longer than a projectile shot from an OEM 18.5″ Ruger 10/22 barrel. I gathered a chronograph and two additional 10/22 rifles – one with a Ruger OEM 18.5″ barrel and one with an Ruger OEM 16″ barrel – for velocity testing. Both of the OEM barrels that I used for comparison have very high round counts and that may be playing a role in the data. I used CCI Mini Mags for the testing and saw numbers from the V7 10/22 20 CAL barrel that were more in line with velocities from the Ruger OEM 18.5″ barrel. The V7 10/22 20 Cal barrel averaged 1227.2 FPS over 50 rounds of CCI Round Nose Mini-Mags. The standard 16″ Ruger OEM barrel averaged 1219.2 fps and the 18.5″ averaged right at 1224 fps. The 16.1″ V7 barrel was producing velocities faster than the longer 18.5″ barrel. Some of that could have to do with the round counts on the barrel in question and some with the properties of the V7 barrel. Accuracy was excellent with CCI Mini Mags. I generally sight my .22 rifles at 50 yards and that is also where I did my accuracy testing. The groups averaged just over .69″ in max spread at 50 yards with the group pictured below being pretty typical. I suspect a better shooter could print more impressive results as I often had 1 or 2 fliers that had a large effect on overall group size. Aside from all the performance numbers, I should also point out the less tangible qualities of this barrel. It is light, short, and looks great. So many after-market barrel makers neglect the sporter profiles barrels. Not everyone wants a heavy target rifle. Some of us want to actually spend time with our rifles in hand, walking the woods and that is the domain of the sporter profile barrel. These barrels could really stand to be tested beyond my capabilities to truly flesh out their claims – especially regarding down range energy. However, here is what I know… The barrel offers a great accuracy improvement over an OEM barrel. The V7 10/22 20 CAL barrel shows a slight increase in velocity over OEM barrels (even OEM barrels that are longer). Finally, the projectiles actually are swaged to a smaller diameter and increased overall length which should theoretically increase BC and thus down range performance to some extent. All of that points to confirmation of the claims. I am impressed with the performance and handling of this barrel. I have found it to be a source of endless fascination and conversation with other gun guys… and it shoots. Disclosure: This barrel was sent to me by V7, free of charge, for this review. Krinkov style muzzle brakes are designed to direct concussion forward and away from the shooter while also providing some muzzle rise mitigation. However, many of them also turn your carbine into a nose-heavy fence post due to their weight. 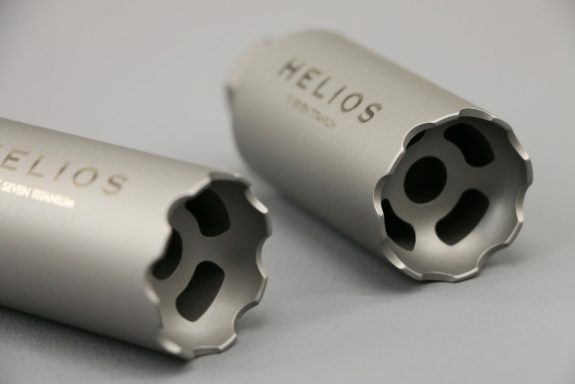 The new Helios Muzzle Device from V Seven Weapons is constructed from titanium so it weighs considerably less than what similar steel devices weigh at just 2.5 ounces. It adds 2.2 inches to the over all length of the barrel and has a 1.25″ outer diameter so it can fit under most extended handguards. The Helios is available in black or silver finishes and 1/2×28 or 5/8×24 thread pitches. The 5/8×24 version will accommodate projectiles up to .338″ in diameter. The new V Seven Weapon Systems’ 20″ 6.5 Creedmoor Match Barrels are now available for your AR308 (or maybe AR6.5… I guess). 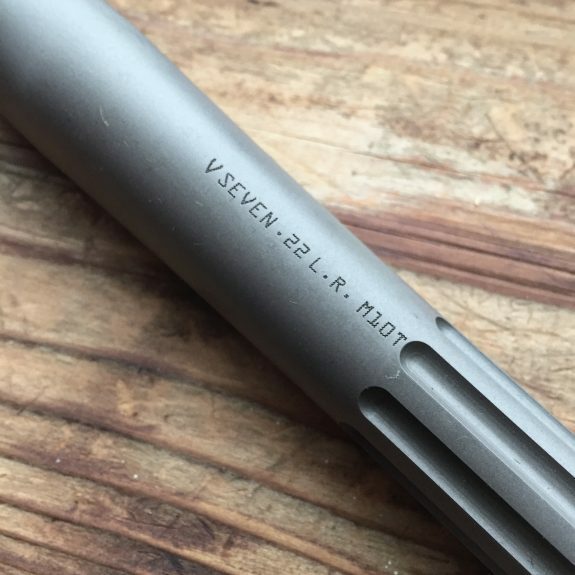 The barrel has many of the same features found on other V7 barrels like 416R stainless steel construction, polygonal rifling, V7 Match Chamber, Melonite treated barrel extension, optional fluting, an included pinned gas block, and gas tube. V Seven’s line of Magnesium Hyper-Light Handguards are now available for the AR308 with SR-25/DPMS pattern barrel nuts. 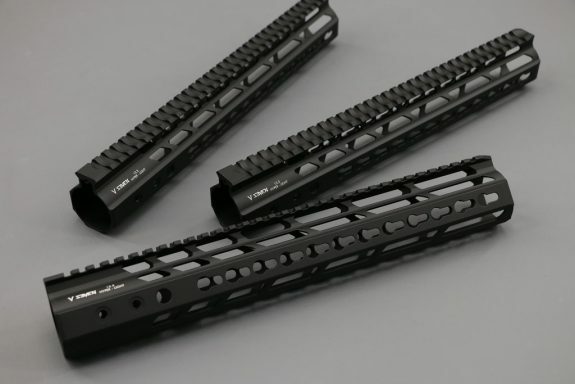 The handguards are currently available in 13.5″ length with KeyMod and 15″ length with M-LOK. New lengths and combinations will be available soon. 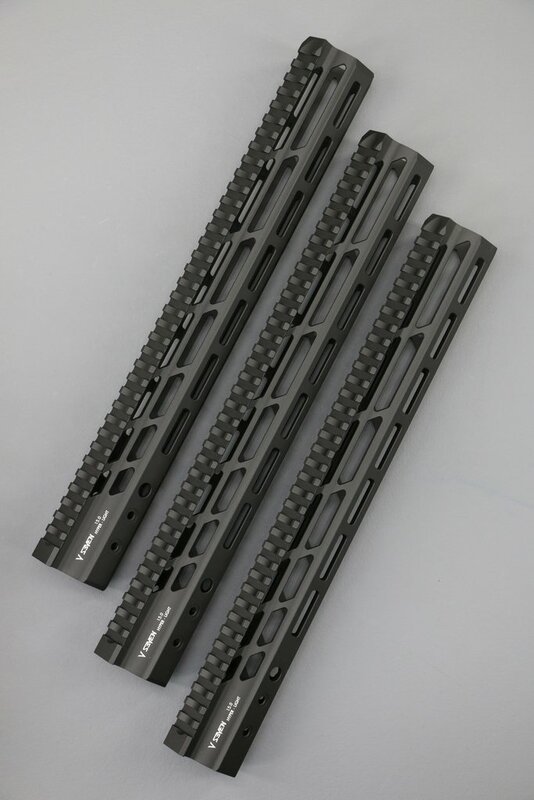 Like their AR-15 counterparts, these handguards are manufactured from an aluminum and magnesium alloy that results in a roughly 30% weight reduction versus 6061 aluminum. They also feature the same ceramic like finish that is applied via a plasma deposition process and offers increased abrasion resistance versus hard anodization. 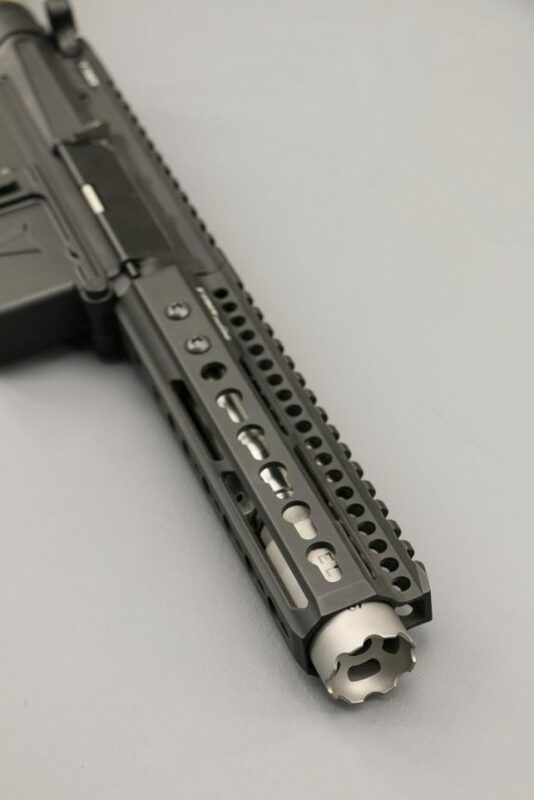 The 15″ M-LOK rail weighs in at under 7 ounces (+ 2 ounces for the barrel nut) and the 13.5″ KeyMod weighs in at just over 6 ounce (+ 2 ounces for the barrel nut). 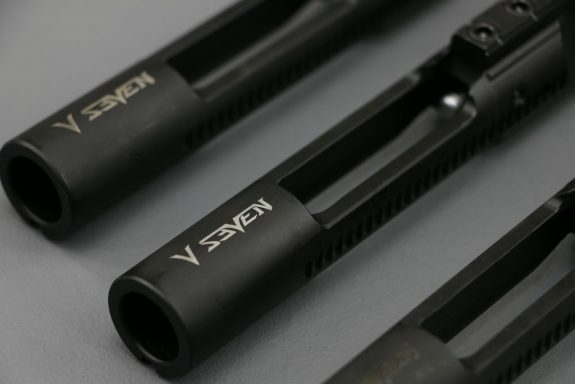 V SEVEN is now offering a 458 SOCOM bolt carrier group to go with the barrels that they already offer. The new BCG has the basics covered – properly staked, made from Carpenter 158 (bolt) and 8620 (carrier), chrome lining (carrier bore), MPI/HPT tested, and manganese phosphate finish. It also has a number of V SEVEN touches like their improved cam pin, firing pin, and firing pin retaining pin. It also carries V SEVEN’s lifetime warranty which is somewhat unique among bolt carrier groups. Check out the new V SEVEN 458 SOCOM BCG for your big bore AR build. 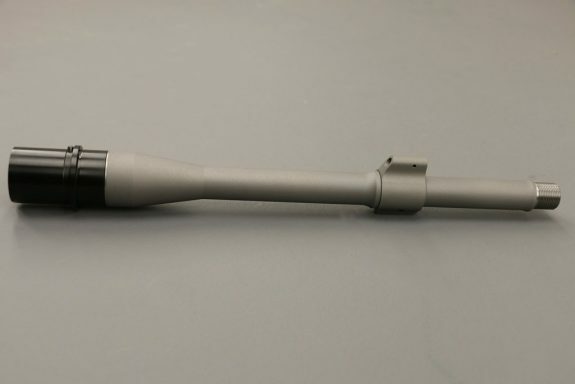 V SEVEN’s new Stainless 11.5″ Match Barrel chambered in .308 Win. is now available. It features 416R stainless construction with polygonal rifling and a 1 in 10″ twist rate. This barrel has V SEVEN’s match chamber and the bore is lapped. It also has a Melonite coated barrel extension with extended feed ramps. 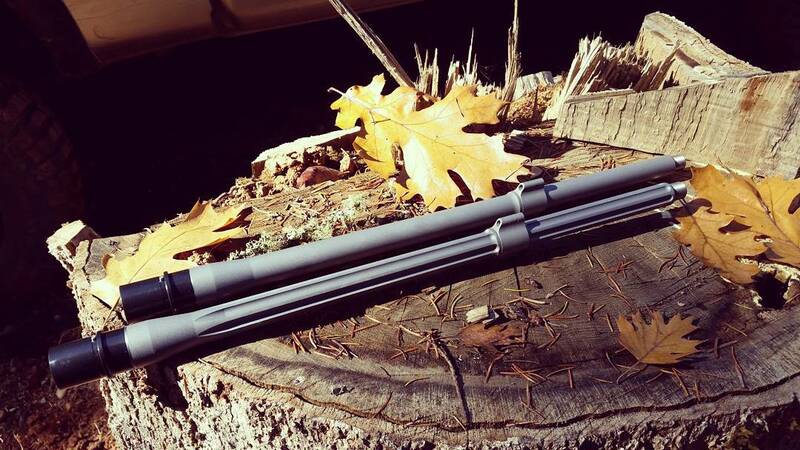 This short length and lightweight profile of this barrel keep weight to a minimum. It weighs 27 ounces with the included low profile gas block and fluting is available to reduce weight even further.